Who doesn’t love playing games on their iPhone? I think that my friends and family would agree that I waste way too much time on my phone playing games. However, games are one of the many things that show off the incredible things an iPhone can do with its crazy power and beautiful display. Almost everyone who loves playing games on their iPhone loves to brag to their friends how great they are at them. 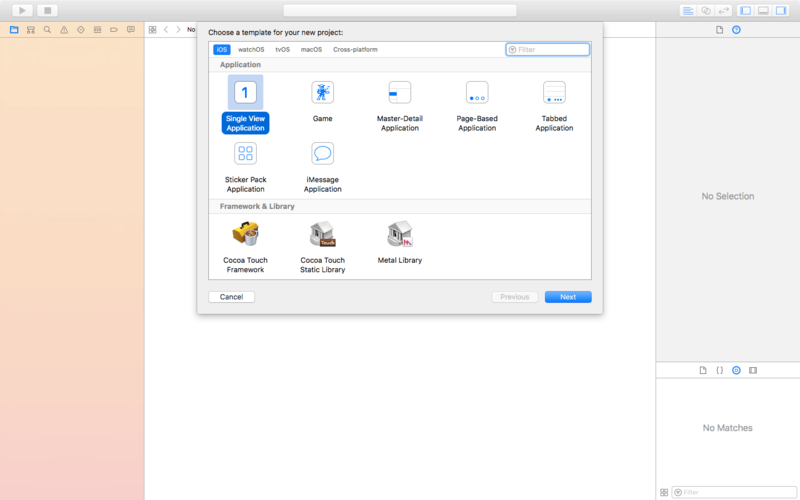 That is why Apple announced ReplayKit at WWDC15 along with iOS 9. 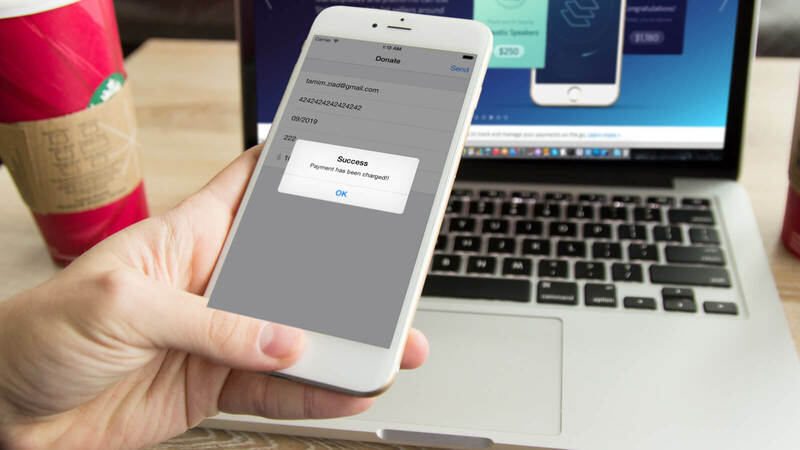 ReplayKit is an incredible API which makes it extremely simple for developers to integrate safe and efficient screen recording into their apps. This way, with a tap of a button, players can record their game and instantly share it with their friends. Now before you say it, I know that iOS 11 introduced a way to record your screen anywhere, but that feature is not as intuitive for gamers as it requires control center to be opened, and also requires that the user leaves the game to edit and send the video. ReplayKit is made specifically for gamers. 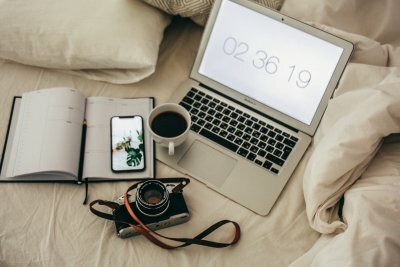 Today, I am going to show you how to make a simple screen recording app. 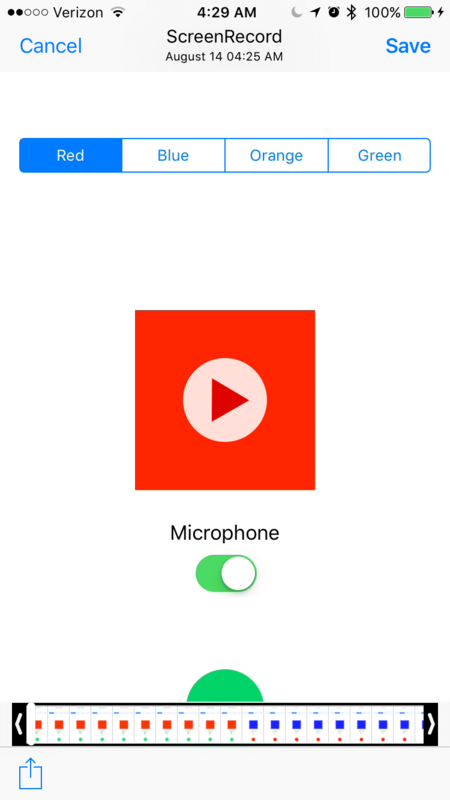 The app will feature a recording start/stop button, a label that shows the status of the recording, and some UI elements to play with so you can record yourself doing something. Lets get started! Note: I will be creating this tutorial with Swift 3 in Xcode 8 as there have been many problems reported with ReplayKit in iOS 11 beta. However, the ReplayKit code in this sample app is the same in Swift 3 as it is in Swift 4, so it should work the same if you are following along in Xcode 9. You will also need a physical device to run this app as screen recording does not work in the simulator. The app we will be making today is extremely simple to write and use. There is a green button which is used to start screen recording. Once tapped, the button will turn red and the status label at the top of the screen will indicate that it is currently recording. The app also features a segmented view with various color names in it. Tapping a color will change the background of the square in the middle of the screen to that color. This is here so you can record something changing on the screen. There is also a microphone toggle so you can choose if you want to record with the microphone or not. Let’s do this! Time to open Xcode and create a new project. Choose the Single View Application template for this app. I will be naming my project ScreenRecord but you can name it whatever you wish. Just be sure to set the language to Swift, and we don’t need Core Data in this app, so leave that unchecked. Once you have created the project, go into the Deployment Info and uncheck the boxes next to Landscape Left and Landscape Right. No need for them in this project. With this app’s simple UI, this should not take long. Go ahead and open up the Main.Storyboard in the project navigator. Drag a Label to the top of the view and stretch it out a bit. I made mine 165 pixels wide. Make the label say Ready to Record (don’t forget to do that, it’s important). Add a Segmented Control a little under that. Make the segmented control have 4 segments and label each one a different color: red, blue, orange, and green. Make sure to stretch it out enough so the names are not cut off. Next, add a View in the center of the view controller. Make it square (I made mine 150×150) and change its background color to red. Add a Switch a little under the square. If you wish, you can put a label over the switch that says Microphone like I did. Lastly, add a Button under the switch. Make it square (mine is 65×65), delete its title text, and change its background color to green. 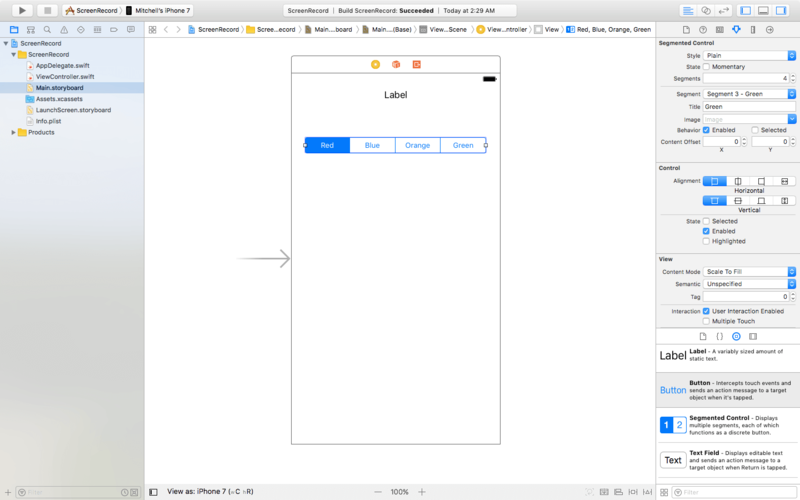 I will not be covering how to constrain these elements with Auto Layout in this tutorial. However, I highly suggest that you do. 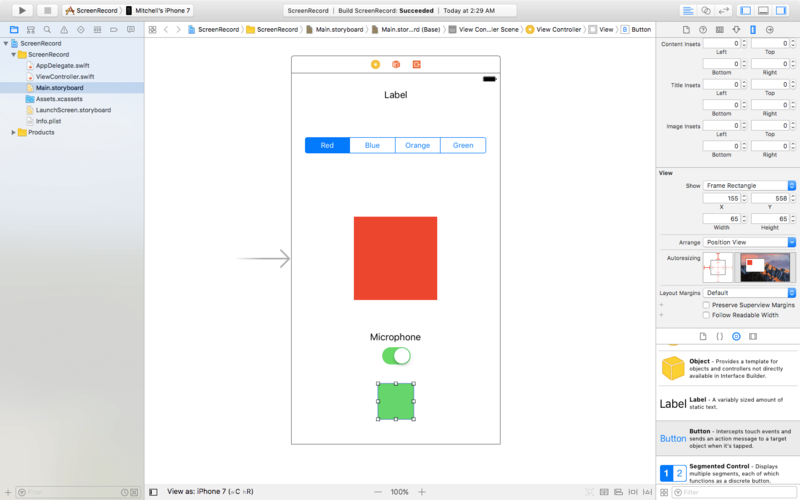 Check out our Auto Layout Tutorial if you would like to learn how to use it. 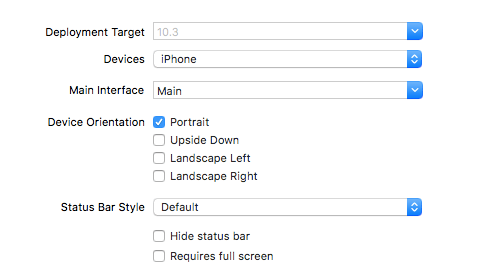 If you will not be using Auto Layout, be sure to set your storyboard size to the type of the device you will be running the app on. Now it’s finally time to start coding! 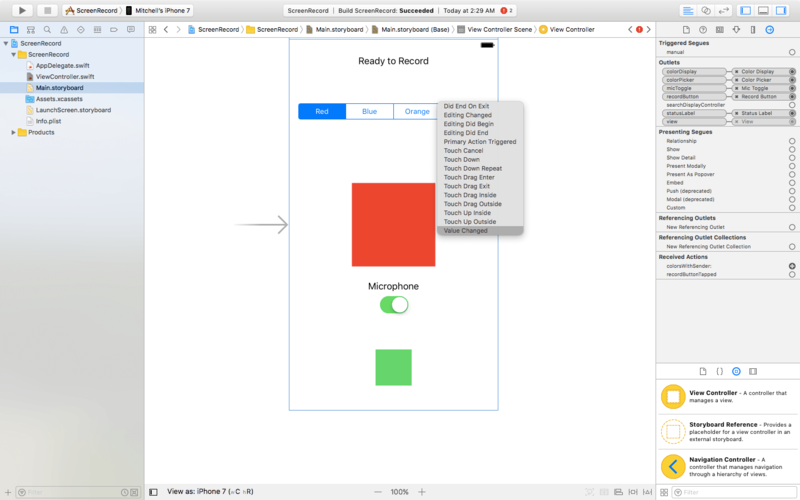 Head over to your ViewController.swift file in the project navigator and start by importing the ReplayKit framework above the class under where it says import UIKit. @IBOutlet var statusLabel: UILabel! @IBOutlet var colorPicker: UISegmentedControl! @IBOutlet var colorDisplay: UIView! @IBOutlet var recordButton: UIButton! @IBOutlet var micToggle: UISwitch! Now we need to create an object for our screen recorder. Declare the following variables under where we put the outlets. 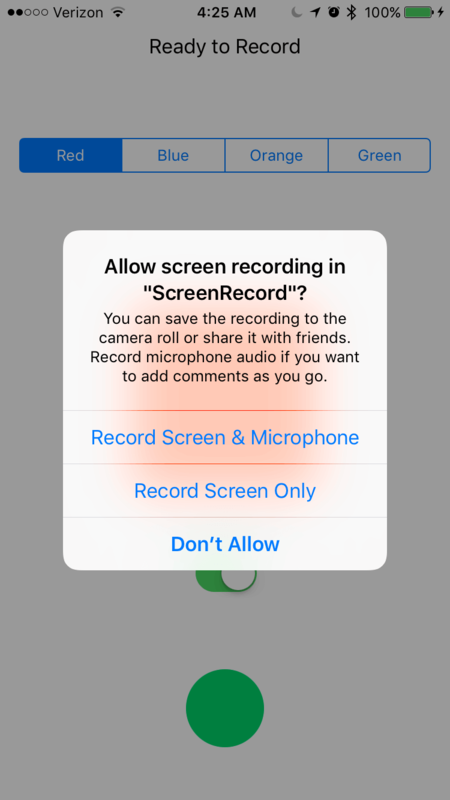 RPScreenRecorder is the shared recorder object providing the ability to record audio and video of your app. The isRecording variable is used to keep track of the recording status, whether it is doing a screen recording or not. This make the button circular. If you made your record button the size that I did (65×65), this will make it a perfect circle since 32.5 is half of 65.
statusLabel.text = "Ready to Record"
What this does is turn the microphone switch on, set the statusLabel text to show that the app is ready, Changes the statusLabel text color to black, and changes the background color of recordButton back to green (it will be changed to red during recording). Let me explain what this does. The action is triggered by a sender that will be a UISegmentedControl. We have added a switch which takes the selected segment of the segmented control and changes the square view’s background to the right color. This is a very simple function for toggling the recording mode. If the status of isRecording is false, that means that we’re not recording yet, so we call the startRecording() function. If the value is set to true, that means that the app is in recording mode, so it calls the stopRecording() function. Now, we have not created these two functions yet, so ignore the errors that come up for now. Now that we have finished adding all of the outlets and actions needed for this project, head back to the Main.storyboard so we can connect them to the proper UI elements. Click on the view controller and then click on the connections inspector (the little arrow in the utilities panel on the right). Now drag all of the outlets to their respective subviews. Now it’s time to connect the actions. Connect the recordButtonTapped action to the record button at the bottom of the view, then select Touch Up Inside. Now connect the colorsWithSender action to the segmented control. This time make sure you select Value Changed so the action is called each time a new segment is selected. 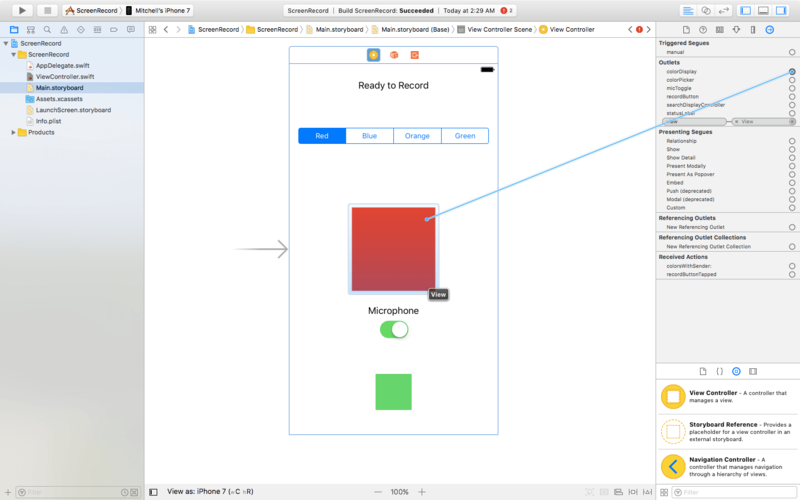 Now that all the actions and outlets are connected, it’s time to head back into the ViewController.swift. It’s simple as that. This guard checks if the recorder is available. If it’s not, an error will be printed and the function will be returned. Make sure to put all other code in this function under this guard. If the switch is on, we enable the microphone by setting isMicrophoneEnabled to true. If not, we disable it. Simple as that. 1: We call the startRecording function on the recorder. This function has a handler. 2: In the handler, we add a guard which makes sure there is no error. If there is an error, we print an error message and return the function. 3: The recording has successfully started. We print that it is working and change the UI elements to show the user that the app is recording. 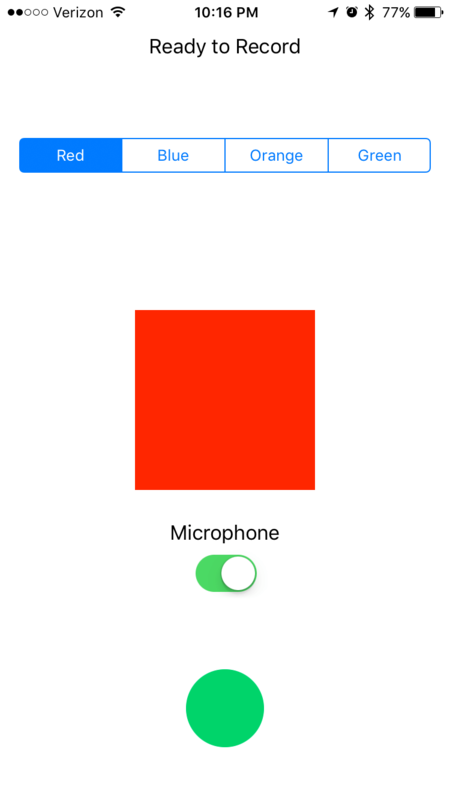 To do this, we disable the microphone switch, set the recording button background to red, set the status label to say recording and change its text color to red. Wouldn’t it be great if we can add a cool edit view where the user can preview their recording, trim it, and then send it to their friends all without leaving our app? Well lucky for us, Apple gave us the RPPreviewViewController which does just this and all we need to do is call it! The stopRecording function creates a preview controller which we can call in the handler. If the preview is not available, the function will be returned instead of the app crashing! Next, we want to add an alert view. Say the gamer played a bad round and doesn’t want to share the recording with their friends. Well instead of going into the preview controller, watching their bad game moment, and then canceling, they can just delete the recording right after they stop it. Now after you add this, go back up to the class declaration way at the top of the ViewController. You need to add the preview controller delegate. Next to where it says UIViewController add a comma (,) and type RPPreviewViewControllerDelegate. 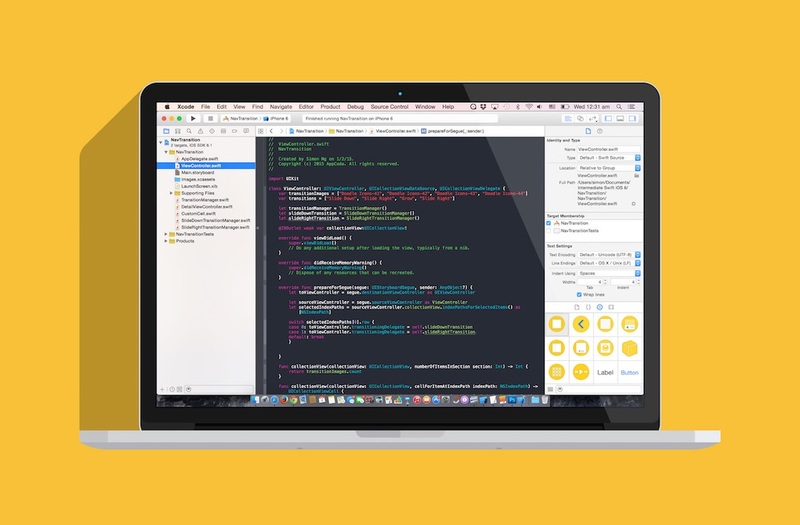 1: We create an alert controller with the appropriate title, message, and style. 3: We create an edit action. If tapped, this action will open up the preview controller so the gamer can watch their recording, save it to their phone, edit it, or do whatever they want with it. 4: We add the actions to the alert and present it. 5: We call the viewReset() function so the view is just like new when the alert is dismissed. This short delegate function dismisses the preview controller when the user taps the cancel button. Now it’s time to put your hard work to the test. Run the app on your phone and tap the green record button. You will notice that an alert comes up asking for your permission to record the screen or record the screen with the microphone. This is an awesome thing about ReplayKit because Apple automatically has the app ask for permission. This way we don’t have to program it ourselves like we do with coreLocation and notifications. When you’ve had your fun, tap the record button again to stop the recording, you should now see the alert view asking what you want to do with your recording. If you sang a song and you don’t think you’re a great singer, maybe delete your recording and take another one. However, if you want to show off your awesome color changing square and singing voice, hit the edit button. Now you can watch your recording, trim it, save it to your photo library, or share it with the world. If you don’t think your friends will understand how amazing your new recording is, tap Cancel in the upper left to dismiss the view and delete your recording. Congratulations! You just made an epic screen recording app that will keep you entertained for hours… Well I guess not, but even though this app does not do much, it has taught you everything you need to know to add awesome screen recording into your game with ReplayKit. Go and add screen recording into your games and leave a comment telling me so I can check it out! Wanna do more with ReplayKit? Stay tuned with my next tutorial on how to add live broadcasting. How can a game not be awesome if it has live broadcasting?! If anything in this tutorial confused you or you have some suggestions, feel free to leave a comment below and I can help you out! For reference, the complete demo app that I created while making this tutorial is available on GitHub. For more details about the ReplayKit framework, you can refer to the documentation. What do you think of ReplayKit? Did you ever think that it can be so easy to add screen recording into your app? Leave a comment and let me know.